You will feel comfortable during your massage. Deep Tissue Massage is a type of massage aimed at the deeper tissue structures of the muscle and fascia, also called connective tissue. Deep tissue massage uses many of the same movements and techniques as Swedish massage, but the pressure will generally be more intense. 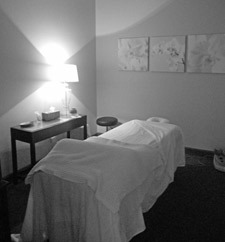 It is also a more focused type of massage, as our therapist works to release chronic muscle tension, stress and knots. Trigger Point Massage - A trigger point is a tight area within muscle tissue that sends pain to other parts of the body. A trigger point in the neck may trigger a pain in the shoulder. The pain may be sharp and intense or a dull ache. Trigger points are caused by overuse of the muscle or they can be caused from an injury. Patients often notice a significant decrease in pain after one trigger point massage. Orthopedic Massage is a type of massage which is focused on treating painful conditions which affect the soft tissues of the body. The massage therapist may integrate a range of techniques to treat these conditions, ideally adapting his or her style for each patient, as every person’s body is slightly different. A therapist who performs orthopedic massage focuses on problems with the patients musculoskeletal system. The therapist releases tight muscles, help to stretch shortened muscles and tendons and decompress joints. The goal is to normalize the soft tissues of the body, both to treat specific conditions and to keep clients generally healthy and fit. Orthopedic Massage is great for sports injuries, scar tissue, mobilization, neuromuscular therapy, and strengthening of muscles. Hot Stone Massage - A Hot Stone Massage is not simply the “gliding” of heated stones lightly upon the surface of the skin, but rather the stones are used as tools to deliver effective tissue and muscle massage at a pressure level comfortable to the patient. The patient can request light, medium or deep pressure, which is the beauty of the hot stone massage technique. It can be customized in an instant to the request of the patient. The hardness of the stones makes for a deep tissue massage and is easy on the joints of the therapist’s hands. The heat from the stones relaxes muscles and increases the blood flow to the area being worked on which is said to further accelerates the healing process. This increase in circulation and the relaxation of the muscles is also claimed to aid in mental relaxation. Contact Zink Chiropractic us to see how massage therapy can compliment your chiropractic care. Like our Facebook page and get a 1 hour Massage for only $45!! !